You have our most sincere commitment of 100% total customer care & satisfaction! Our monitoring agreements are for 1-year only. NAP can safely monitor almost any system manufactured. Some of the most common systems are listed below. We have a vast wealth of resources available to reprogram just about any system. We will look over your entire existing security system. Your home or business building/layout will be looked over carefully. The wiring in your alarm panel box will be looked over and fixed if needed. The code programming that makes your system work will be looked at line by line. Your particular needs and situations will be used to properly program your system. All existing windows, doors, motions, glass-breaks, and smoke detectors will be tested. A comprehensive written security assessment of your existing system will be done. Any weakness in your system will be noted and recommendations will be made. Your keypad(s) will be cleaned and your zone descriptions will be updated. Decals and sign(s) will be placed at appropriate places at your home or business. A refresher orientation will be conducted and questions answered if needed. A keypad info/reminder sheet for your system will be set about each keypad. We will not takeover any system without our Takeover Questionnaire Form being signed. We have no intention of infringing on any other companies' customers or monitoring contracts. We do not seek out any other specific company's customers. Rather, it is customers who seek us out after finding out what we have to offer. If you are presently under a monitoring contract with another company and you do not wish to continue with them, we can still monitor your system. You will still be fully responsible for any money due to your original company for monitoring service fees or equipment rental/owner fees. 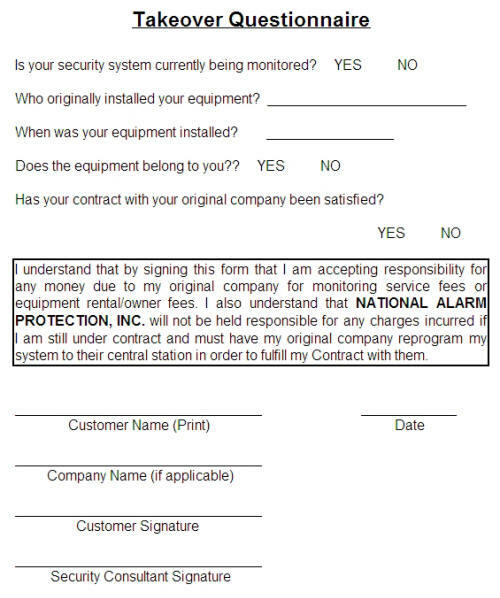 You also understand that NATIONAL ALARM PROTECTION, INC. will not be held responsible for any charges incurred if you are still under contract and must have your original company reprogram your system to their central station in order to fulfill your monitoring contract with them. We will likewise not takeover any system without our Connection/Takeover Clause Form being signed. National Alarm Protection's main objectives are to design, install, and maintain the most reliable systems available for our customers and to continue our successful campaign to reduce unnecessary false alarm activity within the security industry. Any existing customer-owned equipment and/or wiring must be in proper working condition. 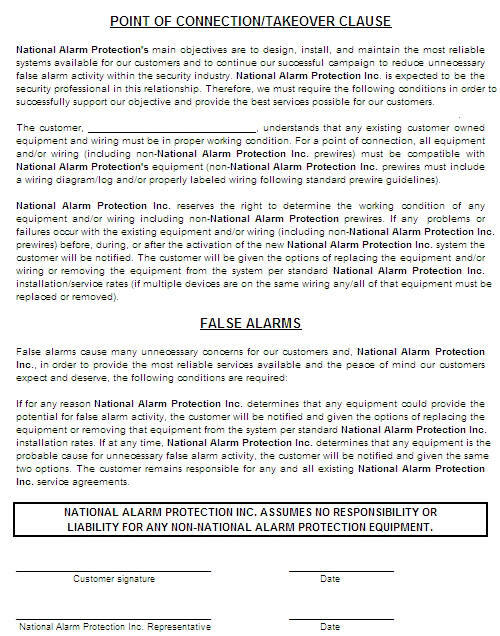 If for any reason National Alarm Protection Inc. determines that any equipment could provide the potential for false alarm activity, the customer will be notified and given the options of replacing the equipment or removing that equipment from the system per standard National Alarm Protection Inc. installation rates. If at any time, National Alarm Protection Inc. determines that any equipment is the probable cause for unnecessary false alarm activity, the customer will be notified and given the same two options. The customer remains responsible for any and all existing National Alarm Protection Inc. service agreements. Copyright © 2005-2009.National Alarm Protection, Inc. All Rights Reserved.